Chute Systems presented yet another successful Basic Static Line Parachute Jump Course under the expert guidance of Waldo Krahenbuhl (Co-owner of Chute Systems) over the period 9 April 2012 to 27 April 2012, in Namibia. We are also geared and ready to start with our next course on the 14th of May 2012. As part of our Static Line Parachute Training program, all students must undergo a 6 week Pre Selection Phase during which students are physically and mentally prepared for the Selection. Revision on all the Basic Military Skills, such as Musketry Training, Navigation, Field Craft, etc. is part and parcel of the Pre Selection Phase. At the end of the 6 weeks, students are required to pass the Parachute Selection Phase during which their military skills, fitness and mental capabilities are tested to the maximum. Only students who successfully complete the Selection Phase are allowed to proceed with the Basic Static Line Parachute Jump Course. The pass rate of pre-selection and selection is approximately 30% of the group that starts. 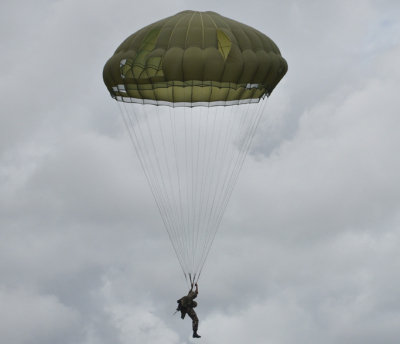 The Basic Static Line Parachute Jump Course consists out of a 3 to 4 week training program that includes 1 week of Ground School Training and 2 to 3 weeks of Practical Parachute Jumping. During the first week students are taught all the relevant Parachute Drills and Techniques to the satisfaction of our World Class Instructors. 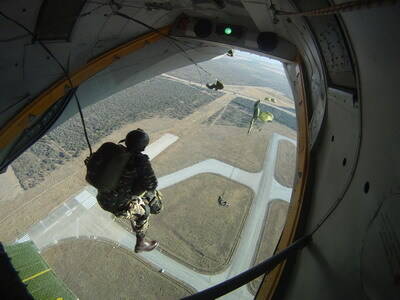 During the last 2 to 3 weeks students must successfully execute 9 Parachute Jumps which consists out of 5 Clean Fatigue jumps, a Combat Webbing and Weapon jump, a Personal Weapons Container (PWC) jump and a Night jump. Due to the strict and physical and mental nature of the Pre-selection and Selection Phases, approximately 30% of all students who start successfully complete both Phases. This is a Critical Success Factor of our Training Operation, ensuring our Clients that when our students qualify as Paratroopers they are really the best of the best soldiers in their respective Defence Forces. Due to the high level of expertise and professionalism of our World Class Instructors and Parachute Equipment, Chute Systems can boast with an excellent safety record regarding all Disciplines in Parachute Jumping. All our Instructors are Ex South African Paratroopers and Special Forces Operators boasting with more than 200 years of experience between us. Depending on the Ground School facilities capability, we normally train between 12 to 16 students per Instructor ensuring once again that each student receives optimal attention from his Instructor. Chute Systems have also successfully developed and implemented a Parachute Training Ground School comparing to the one of the best of its kind in Africa and also the first of its kind in Namibia. This facility is equipped with all the relevant equipment and training aids required for Parachute Training and can handle 64 students per course. Chute Systems will be exhibiting during the bi-annual Africa Aerospace and Defence (AAD) Exhibition, over the period 19 to 23 September 2012, at the Waterkloof Air Force Base, in Centurion, South Africa. The company will be exhibiting in Hanger nr 2, Stand 2C51 and everyone is invited to come and meet the owners and instructors personally and to discuss your training and parachute equipment requirements.